Happy Humpday friends! Hope everyone is having a fabulous week so far! It's nice to be back in the office and have some normalcy return to my schedule. As fun as it is to be out and about, it's also nice to have a normal schedule and feel like you're actually getting something accomplished, ya know? Today will be my first time working out in over a week and I have a feeling it's going to be really rough. Luckily this cute tee makes up for all the soreness I'm going to be feeling tomorrow! It's definitely no secret I love stripes. Ok, maybe it's a little more than love, I'll admit I have a slight obsession with stripes. And lately I've been seriously crushing on ruffles so when I saw this tee I knew I had to have it. Two of my favorite things in one top? Definitely a no-brainer! It's also super comfy which is a definite plus. I love pieces that can be dressed up or down and this tee definitely fits that! I wore this top with a pencil skirt to work and then switched into jeans and wedges to walk around and have dinner. Speaking of walking around, I know that every blogger and their mom has these Marc Fisher wedges and now that I own a pair, I totally understand why. These are quite possibly the most comfortable non-flats I own. They're definitely a little heavy but you get used to the extra weight pretty quickly and I love that no matter how far you walk in them, they never hurt your feet. As a short girl who loves wearing heels, these are definitely a godsend! Hope everyone has a fantastic rest of the week! Absolutely loving those bold ruffles! That tee couldn't be cuter! You can never have enough stripes - loving the ruffles too! I'm with you on the love for stripes and ruffles. I'm kicking myself for not ordering this top! It was in my shopping cart and I decided against it. It looks so cute on you! And love that it can be dressed up like you did with a skirt for work! I might have to go order it now haha! Girl, I am with ya on the love of stripes! This look is absolute perfection! This top is so cute and I am in love with those wedges! 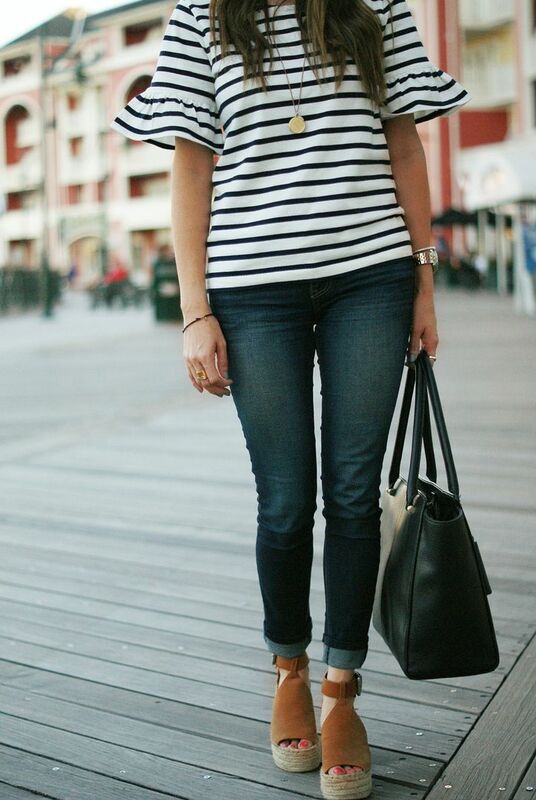 The stripes and ruffles are the cutest combo! Love the shoes too and yay for them being extra comfortable! That's always the best. I am so in love with the sleeves on this top! 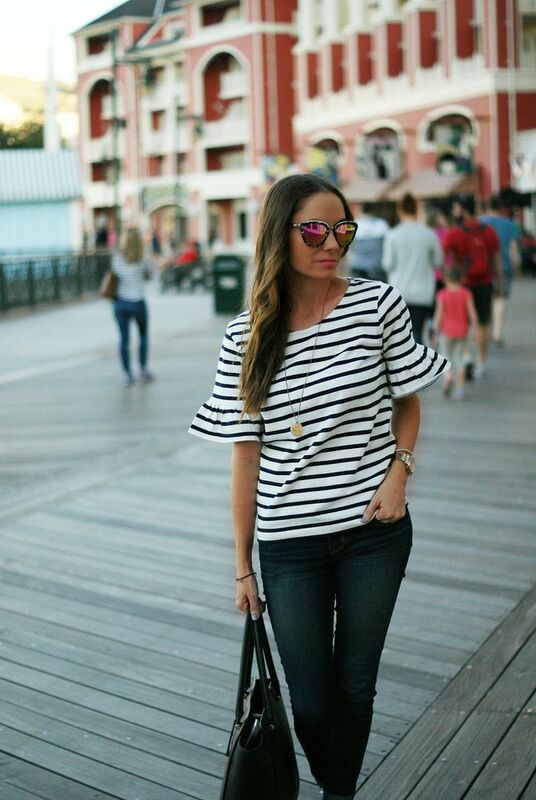 Such a fun twist on your basic striped tee! I totally agree... stripes are my fav! Loving this fun top and your shoes! Obsessed with the top! 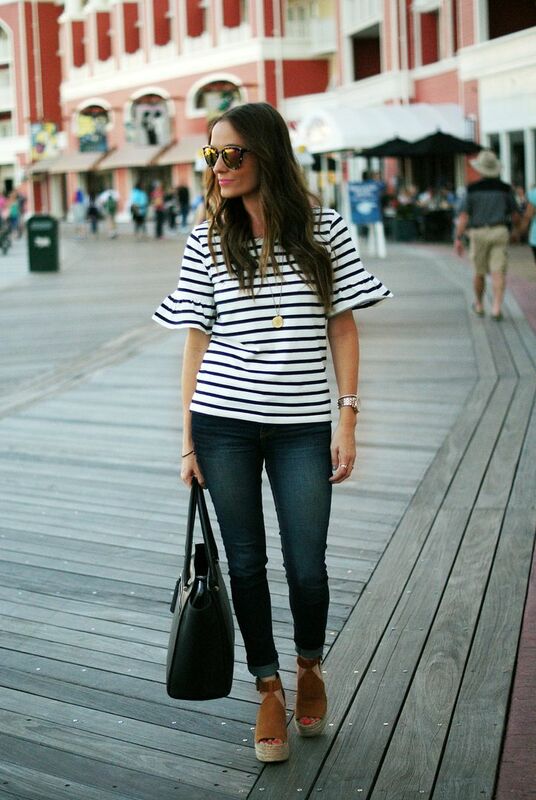 I love stripes, too, and have been loving ruffles this season as well. Perfect combo! I'll take this entire outfit please and thank you! Black, white and ruffled sleeves - I need this! Great top for any look! This top is so cute, love the whole look! I love love love that top so much! 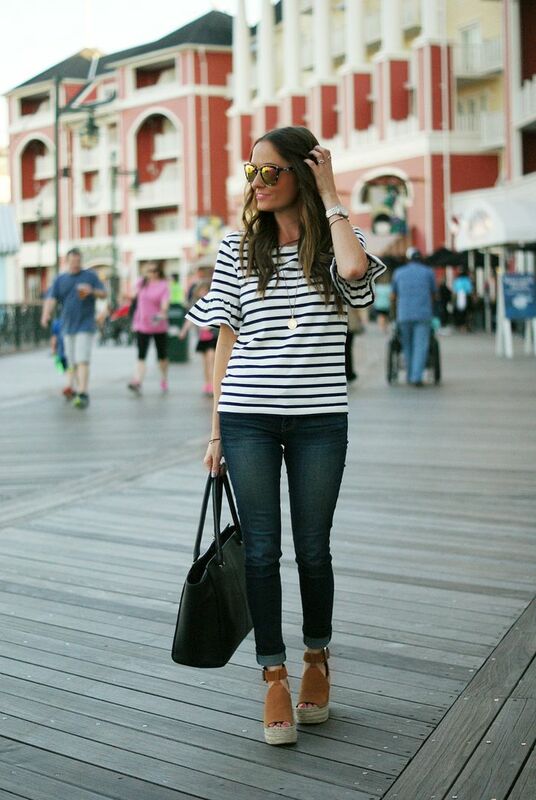 It's beyond cute with the stripes and the bell sleeves! And you're totally right, as much fun as it can be to have a change from your normal schedule, sometimes it just feels good to get back to normal. Such a cute outfit! I snagged a few things at the J Crew outlet yesterday with the flash sale and didn't see that when I browsed. it looks so cute on you and you styled it so well! I love everything about this top!!! So cute & perfect for work and play! I adore this top! It's so cute, especially with the ruffle detailing. Hope you have a fabulous day, sweet girl! I love how the ruffles elevated this top from basic to trendy! 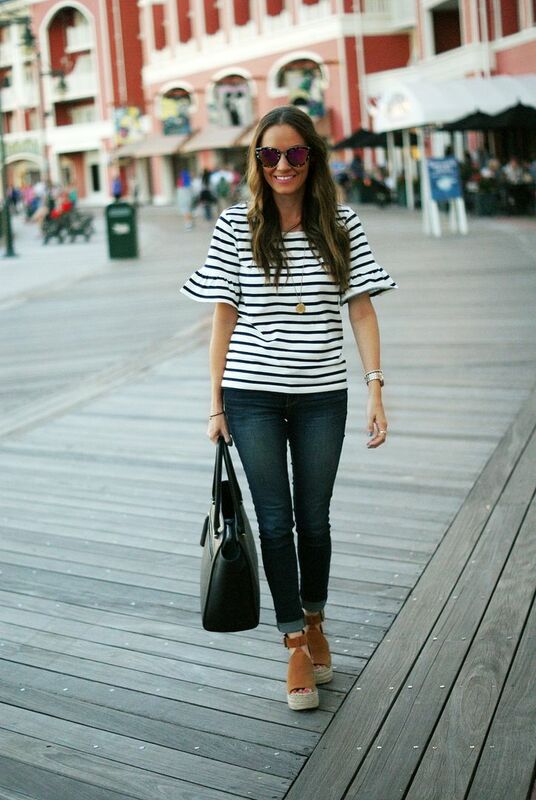 Stripes look fab on you and the ruffle sleeves add a cute touch to the outfit. I think I've commented before on your sunnies, but I absolutely love them. Where did you get them from? They're perfect for an outfit like this to add some pizzazz. Such a fabulous top!!! You look adorable girlfriend!! Looove this look! I need that top in my life and of course that wedge sandals too! I need to get this top! It is so adorable! Love this top and it looks SO good on you! You're making me miss Disney already! I need this top, like NEED! It is so pretty and I love the sleeves!